Television personality Camille Donatacci Grammer will join Showbiz Tonight as a fashion and celebrity commentator live from the Oscars on Sun, Feb 27, for the Red Carpet special, Showbiz Tonight: Road to Gold. Grammer, who stars on the TV show The Real Housewives of Beverly Hills, will provide her insider perspective on celebrity arrivals and fashion insights. 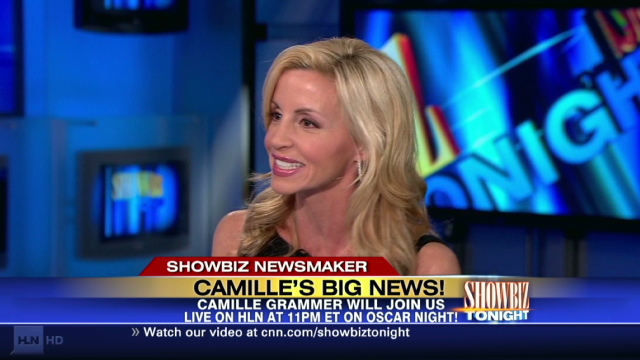 Grammer joins Showbiz Tonight hosts AJ Hammer and Brooke Anderson for the special, live at the Kodak Theater, 7-8 p.m. ET on CNN. Showbiz Tonight: Road to Gold returns at 11 p.m. ET on HLN and will be TV’s only entertainment news show live with the latest breaking news from the Academy Awards. Also joining AJ, Brooke and Camille live at the Oscars will be acclaimed and outspoken actress Sheryl Lee Ralph and syndicated radio host Carlos Diaz with their colorful insights and candid views. Online, CNN’s Oscar coverage will provide exceptional access to the most compelling moments from the 83rd Academy Awards at www.cnn.com/showbiz. CNN.com’s Entertainment section will feature all of the evening’s nominees and winners, photo galleries of the fashion ‘dos and don’ts’, an Oscar-themed quote board, as well as all of the excitement from the red carpet streamed live from 6 to 8 p.m. ET. Users can check The Marquee Blog throughout the night or follow @CNNShowbiz for updates from the red carpet and the winners as they’re announced. HLN is a CNN Worldwide network offered in more than 90 million households in the U.S. CNN Worldwide, a division of Turner Broadcasting System, Inc., a Time Warner Company, is the most trusted source for news and information. Its reach extends to nine cable and satellite television networks; one private place-based network; two radio networks; wireless devices around the world; CNN Digital Network, the No. 1 network of news Web sites in the U.S.; CNN Newsource, the world’s most extensively syndicated news service; and strategic international partnerships within both television and the digital media.